Episode in the Orlando Philharmonic Orchestra's 20th Anniversary video series, chronicling the orchestra's history in Central Florida. This episode features an interview with David Schillhammer, Executive Director since 2010. Topics in the video include performing at the Grand Opening of Universal's Wizarding World of Harry Potter, being conducted by John Williams, sales and programming, the concert experience, the involvement of musicians on the Board, the Orlando Philharmonic's track record of fiscal responsibility, and educational programs offered by the orchestra. David Schillhammer was born and raised in Burlington, Vermont, and received his Bachelor of Music in Bassoon Performance from the Eastman School of Music. He has also served as the executive director of the San Antonio Symphony, general manager of the Saint Paul Chamber Orchestra, and production and education coordinator for the Rochester Philharmonic. On April 30, 2010, Orlando Mayor Buddy Dyer declared April 30th to be "David Schillhammer Day." In celebration of the Orlando Philharmonic Orchestra's 20th Anniversary season, this video series chronicles the orchestra's two decades of history in Central Florida. In this episode, Executive Director David Schillhammer talks about his history with the orchestra. Original 5-minute and 48-second video by Joe Gennaro, Timothy G. Brown, and Lisa Mills: "The Orlando Phil's 20th Anniversary | Executive Director David Schillhammer." Orlando Philharmonic Orchestra, October 25, 2012: Orlando Philharmonic Orchestra, Orlando, Florida. Original 5-minute and 48-second video by Joe Gennaro, Timothy G. Brown, and Lisa Mills: "The Orlando Phil's 20th Anniversary | Executive Director David Schillhammer." Orlando Philharmonic Orchestra, October 25, 2012. http://youtu.be/t7b_mapVRfQ. "Hope youre celebrating: Its David Schillhammer Day." Orlando Theater, April 30, 2010. http://orlandotheater.wordpress.com/2010/04/30/hope-youre-celebrating-its-david-schillhammer-day/. "Orlando Philharmonic Orchestra To Purchase The Plaza Live." The Park Press, June 6, 2013. http://theparkpress.com/orlando-philharmonic-orchestra-to-purchase-the-plaza-live/. In my 13 years with the Orlando Philharmonic [Orchestra], there are so many great stories, but I think one of the really great highlights and one of the great honors bestowed upon the Orlando Philharmonic was the opportunity to play for the grand opening of Universal [Studios Florida]’s Wondrous—Harry Potter's Wondrous World. And that, in of itself, was an honor enough, but we were conducted by the great John Williams, who of course has composed all of that great music and is truly, you know, um, America's genius. As soon as he picked up his baton and started conducting, it transformed the sound of the Orlando Philharmonic. The conductor can have that. It was so inspiring for the musicians of the Orlando Philharmonic—for those of us who were there to witness it—to see the kind of music making that he could bring to the Orlando Philharmonic. He had put his foot down. He wanted either the London Symphony [Orchestra] or the Boston Pops [Orchestra], and they were going to have to fly in these orchestras from either London[, England, United Kingdom] or Boston[, Massachusetts], and, uh, that was, those were his demands and once we sent him recordings of the orchestra and once, uh, some people from Universal came to the concerts, they knew they had a prize-winning, award-winning orchestra right here in their backyard. And he penned the most genuinely, kind, sincere complimentary letter, um, that we have ever received. He didn’t have to do that. And, um, I get goose bumps right to this day thinking about what a great thrill it was performing with John Williams. You have to have both. We have to have exciting programming and we have to tell the story about why it’s exciting programming. I like to think and I—I do believe that every Orlando Philharmonic concert is an event. And the musicians are some of the best in the country, if not the world. I mean, our performances are as good as any American orchestra. I’ll put us up against anybody. And, uh, uh, people respect and appreciate that and they come in record numbers. We elevated the musicians from what is generally the bottom of the totem pole and put them at the top of the totem pole, equal setting with the—with the community board of directors. Our bylaws mandate that 25 percent of the positions on the board of directors be filled by musicians in the orchestra—unheard of to this day. Most American officers have no musicians on the board on purpose. Uh, some might have one or two. Um often, they’re non-voting, and they're never on executive committee, where the real decisions are made and we break down all those barriers. We have a musician who serves on the five-member executive committee, and we talk about things open and honestly at every level, no matter how difficult it is. Well, we have a tremendous track record of fiscal responsibility. I really give credit to the founders and to the Board of Directors. We all work together to ensure financial equilibrium each and every year. We've never had a penny of red ink. Okay, now if I take that down a half step [plays trumpet]. Our educational programs are something for which we’re very proud. Our young people's concerts—every year we perform 28 young people’s concerts for close to 60,000 elementary school students in Orange, Seminole, and Osceola Counties. It’s one of the largest of its kind in the country. We also have “Tiny Tots” for daycare centers we have “Notes in Your Neighborhood” that goes into the school, primarily in those critical after school hours. We have our young composers challenge which is also very special. It started out as the Orlando Young Composers Challenge and now it's the National Young Composers Challenge. I think that you'll find this event has all drama of a spelling bee combined with the passion of great music making. We have adult classes. We have, uh—it’s called “Sounds of Music in Adult Music Appreciation” class we have about a hundred people who sign up every year. They want to know more. They go to the concerts and there’s mysteries about symphony orchestras. They want to know this information and when they know this information they can enjoy the performances more. They become more passionate supporters. And, uh yeah. So our adult music appreciation classes have been really great. So we’re—we’re out there as much as we possibly can, nurturing people’s interests and passion for symphonic music. Correction: Universal's Wizarding World of Harry Potter. Gennaro, Joe, Brown, Timothy G., and Mills, Lisa. 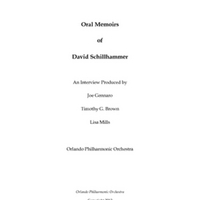 “Oral History of David Schillhammer.” RICHES of Central Florida accessed April 21, 2019, https://richesmi.cah.ucf.edu/omeka/items/show/2281.